Abstract: The use of insecticides incorporated into the soil prior to planting (preplant incorporated, or PPI, application) and approximately 30 days post planting (layby-incorporated, or LBI, application) is a recognized control regimen to reduce insect damage to sweetpotato roots in Mississippi. Seventeen compounds with potential for use as soil-incorporated insecticides were tested in small-plot research trials from 2001 to 2009. Efficacy was evaluated by counting insect feeding scars on marketable roots at harvest. Results within each trial were converted to percent control values based on the water-treated check plots. Results ranged from negative percent control values (more damage than found in the water-treated plots) to nearly 70% reduction in percentage of insect damaged sweetpotatoes. Application of a preplant, soil-incorporated (PPI) insecticide is standard procedure in Mississippi to reduce the possibility of insect damage to marketable sweetpotatoes. Because the soil-inhabiting insect pests of sweetpotato must be in contact with soil in the egg and larval stages, it is probable that the PPI insecticide applications prevent development of larvae of many of these species, particularly early in the season. Layby-incorporated applications of insecticide (LBI) applied when the plants begin to vine are also used to manage soil-inhabiting insects in sweetpotatoes. Seventy-two insect species have been reported from sweetpotato foliage or associated with roots in Mississippi (Reed et al. 2009). Of these, 13 are recognized as major pests, and 22 have been reported to cause damage to roots. Root-damaging pests include the spotted cucumber beetle, Diabrotica undecimpunctata howardi Barber (Fleming 2009), the banded cucumber beetle, D. balteata LeConte, (Cuthbert and Reid 1965, Cuthbert 1967), sweetpotato flea beetles (Chaetocnema confinis Crotch) (Kantack and Floyd 1956, Chalfant et al. 1979), Systena flea beetles (several species of the genus Systena) (Thomas 1927, Schalk et al. 1991), white-fringed beetles (Naupactus leucoloma (Boheman) and N. perigrinis (Buchanan)) (Zehnder 1997), white grubs (larvae of the May and June beetles, Phyllophaga sp.) (Kantack and Floyd 1956, Cuthbert and Reid 1965), and wireworms (larvae of click beetle genera Conoderus, Heteroderes, and Melanotus) (Griffin and Eden 1953, Fronk and Peterson 1956, Cuthbert Jr. 1967, Seal 1990, Chalfant and Seal 1991). Species that are most likely to be controlled by residual insecticides in the soil include the sweetpotato flea beetle, Systena flea beetles, and cucumber beetles (with several generations per season in sweetpotato), and some univoltine species such as wireworms and white grubs. It is notable that Systena frontalis (F.), the red-headed flea beetle, is the primary Systena species in Mississippi sweetpotato fields, and that the elongate flea beetle, S. elongata (F.), which is often referred to concerning sweetpotato production in other areas, is relatively rare in Mississippi. Additionally, spotted cucumber beetle (D. undecimpunctata howardi is the primary cucumber beetle in the commercial sweetpotato production area of Mississippi instead of the banded cucumber beetle, D. balteata, which is the major cucumber beetle pest in sweetpotatoes grown in Louisiana. Reed et al. (2010) reported that 32% (average of samples from 62 fields studied over a 4-year period) of marketable sweetpotatoes were damaged in Mississippi by insects, with at least one insect-caused scar when no insecticide was used. Equally sized samples that received the farmer’s insect control protocol (usually PPI insecticide application plus any foliar applications per season) averaged 26% damage by insects, a decrease of 6%. This rather negligible average reduction in damage resulted from PPI applications of insecticide made from a few days to up to several weeks prior to planting. Upon further analysis, these data showed that for every 10 days between PPI application and planting, the percentage of insect-damaged potatoes increases by approximately 3.0% (Reed, et al. 2010). 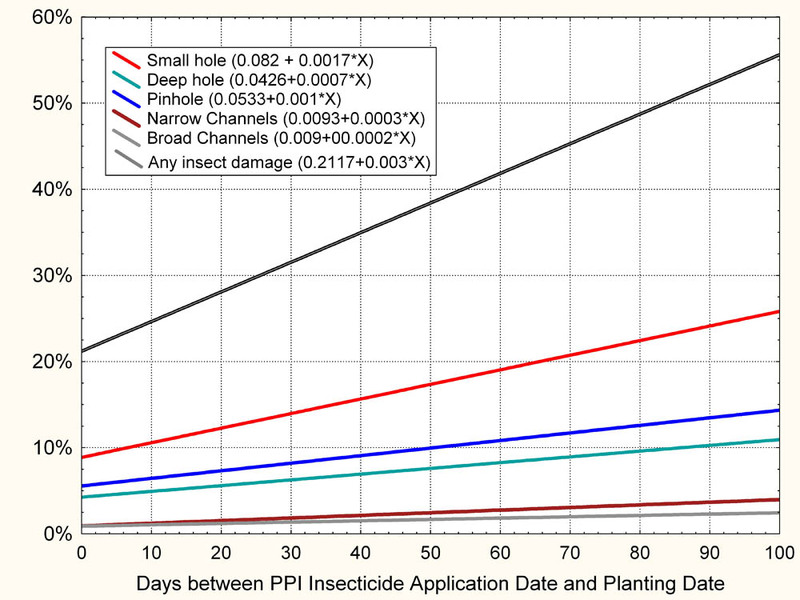 Optimum benefit of a PPI insecticide application is therefore obtained when it is applied as close to planting date as possible within label restrictions (Fig. 1). Small-plot efficacy evaluations of soil-incorporated preplant and layby insecticide applications were conducted in Mississippi during the last few years to provide efficacy information for labeled and possibly useful insecticides for use on Mississippi sweetpotatoes. These evaluations are summarized herein with other relative research results to indicate the efficacy of insecticides and the value of timely application to manage the insect pests in Mississippi sweetpotato fields. Figure 1. Linear regression lines for damage types showing the effect of time between PPI applications and planting on the percent of sweetpotatoes damaged by insects in plots receiving PPI and seasonal, foliarly applied insecticide applications. Results are from analysis of over 31,000 sweetpotatoes from research plots located in a total of 61 sweetpotato production fields in Mississippi from 2004 to 2007. Only damage types with significant slopes (p ≤ 0.05) are shown. 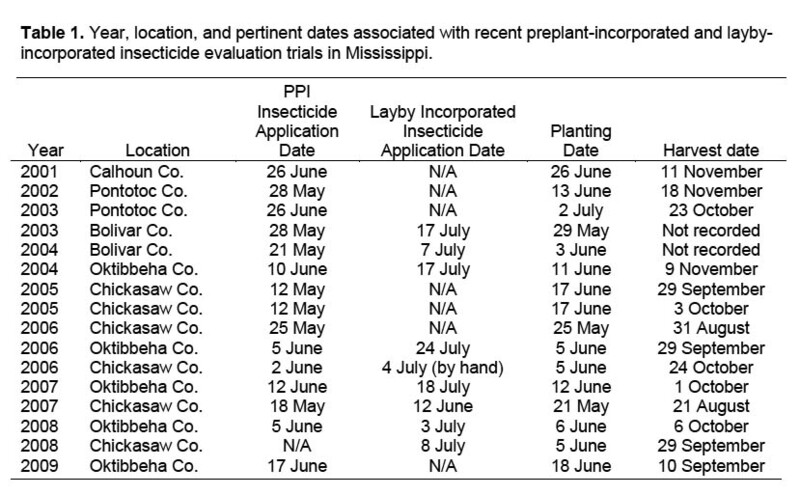 Year, location, and pertinent dates associated with recent preplant-incorporated and layby-incorporated insecticide evaluation trials in Mississippi are listed in Table 1. Plots within individual trials were arranged in a randomized complete block design with four replications. The rows were on 96.5-cm (38-inch) or 101.6-cm (40 inch) spacing, depending on whether the evaluation was conducted at the Mississippi State research farm location (96.5 cm) or on a commercial sweetpotato field. Plots were 15.2-m (50-ft) long by four rows wide (eight rows wide in three trials) with 3.6-m (12-ft) planted buffers at the end of each plot. Where possible, two unsprayed rows were left as a buffer between plots. The liquid insecticides were applied by using a high-clearance sprayer equipped with Spraying Systems’ Tee Jet 8001 flat-fan nozzles or drift-restricting Greenleaf 8001 air injection flat-fan nozzles spaced at 48 cm (19 inches) and calibrated to deliver 93.6 L/HA, (10 Gal/Ac) at 276 KPA (40 PSI). Granular insecticides (two trials) were applied in multiple passes in a band with a perforated container used like a salt-shaker, or applied with a Scott’s Accu 1000 hand-pushed spreader calibrated for each treatment. Granules were applied in a 60-cm (24-inch) band, liquids were broadcast. Prior to treatment, the plots were leveled with a do-all. Treatments were applied one replicate at a time and all plots were re-hipped as soon as a replicate had been treated, unless the test was within a farmer's field where all plots within a trial were re-hipped at the same time. The layby insecticide applications were applied with the same equipment and settings when plants were well established and just starting to vine, and were incorporated with a rotary hoe or by gently re-hipping (prior to 2005). Compounds and rates of insecticides used in the trials are listed in Table 2. Plots were usually harvested by digging 25 potatoes from each row of the center two rows with a shovel, or in some cases with a commercial digger if the trial was conducted on a production field. Roots were then washed and individually evaluated for insect damage. 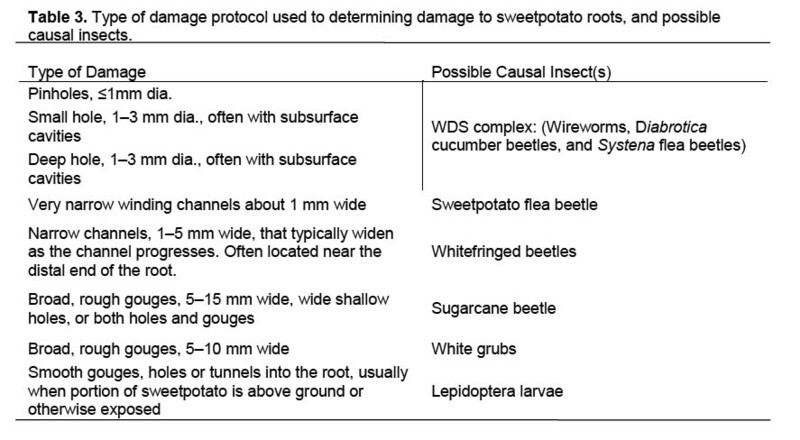 The types of insect damage assessed in evaluations are listed in Table 3. For this paper, the percentage of sweetpotatoes with insect feeding scars within each treatment was averaged across years without regard to type of insect damage. For most years, however, the majority of damage was caused by the WDS complex (wireworm, Diabrotica cucumber beetle, and Systena flea beetle). For most trials, insects were collected from the two center rows of each plot several times during the growing season with a 37.5-cm (15-inch) sweep-net by making 25 sweeps per plot. Hand-vacuums, modified ECHO Shred N Vac ES-210 leaf vacuum/shredder (Echo, Inc., Lake Zurich, IL), were used during 2002 and 2003. These were adapted to vacuum insects by inserting a holding cup with a 50-mesh nylon screen bottom into the end of the suction pipe. Comments concerning the effect of PPI or LBI treatments related to insect numbers will be restricted to two trials that resulted in an insecticidal effect on insect numbers. Analysis of Variance (one-way) of percent control of damage to roots and Fisher’s LSD test (p = 0.1) were used to analyze differences among treatments. Percent control (of damage) was computed as: 100*(1 – (T/C)) where T = percentage of sweetpotatoes damaged in treated plots and C = percentage of sweetpotatoes damaged in water-treated check plots. Treatments were included in analyses if they occurred in more than one trial. Insects generally collected in sweep-net samples included spotted cucumber beetles, banded cucumber beetles, various Systena flea beetles, sweetpotato flea beetles, click beetles, various lepidopterous larvae, and infrequently, whitefringed beetles. Numbers of insects of each of the species collected from these small plots typically did not differ among treatments. This is expected because of adult insect movement among small plots and from migration of insects from sweetpotatoes bordering the plots or from adjacent fields into the research plots. One exception occurred in 2007 when spotted cucumber beetle numbers in plots treated with Imidan or Platinum were significantly lower than in plots treated with a proprietary formulation (LAF-1) or the Lorsban/Mocap treatment; however these were not significantly different from any other treatment including the untreated check. 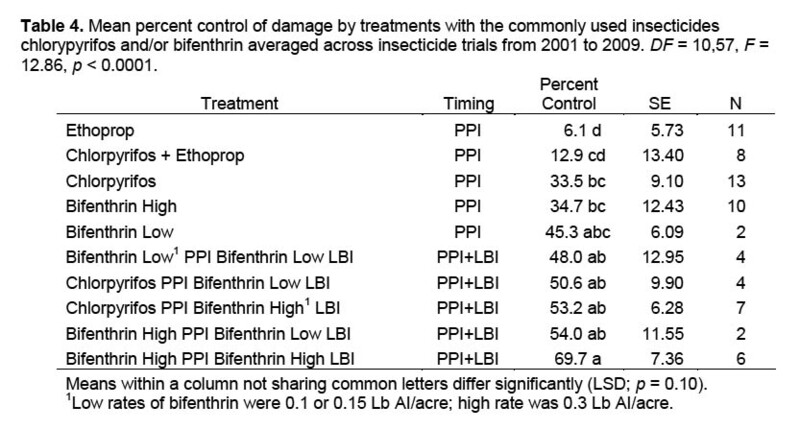 One other exception occurred in a 2002 trial in Pontotoc County in which flea beetle numbers in plots receiving the bifenthrin PPI with bifenthrin LBI treatment did not differ from those of the water-treated check plots, but were significantly lower compared to the plots treated with imidacloprid PPI, imidacloprid PPI with imidacloprid LBI, chlorpyrifos PPI, chlorpyrifos PPI with imidacloprid LBI, chlorpyrifos PPI with novaluron LBI, and the novaluron PPI with novaluron LBI. Treatments that effectively reduce larval numbers in the soil also reduce the number of adults emerging from the soil. In fields with a uniform soil treatment, a reduction of adults would be expected for this reason; however, in small plots, identification of differences of adult insects among treatments is likely to be dependent on the timing of sweep-net samples with emergence of adults, so that differences between treatments could be noted before emerging adults could begin moving from plot to plot. Values used in our computations are means of several samples taken throughout the season and would be buffered in respect to cyclical eclosure of adult insects. 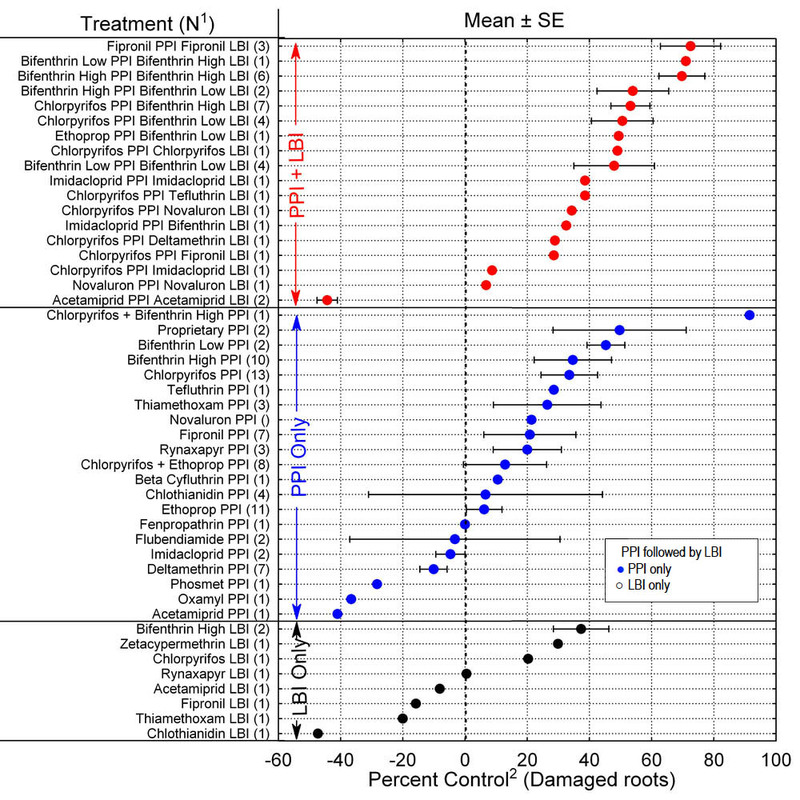 A summary of insect damage to sweetpotato roots based on percent control of damage in plots with PPI, LBI, or PPI+LBI treatments in relation to the water-treated check plots is presented in Figure 2. Treatments with compounds commonly used in commercial sweetpotato production for PPI or LBI applications are summarized in Table 4. Differences in percent control ranged from 6.1% for ethoprop to 69.7% for bifenthrin applied at the high rate for both PPI and LBI applications. Bifenthrin applied at the high rate for PPI plus LBI was significantly more efficacious than PPI treatments lacking an LBI application. Ethoprop as a PPI application resulted in significantly less percent control than other treatments except the combination of chlorpyrifos and ethoprop applied as a mixture. Percent control obtained from treatments with ethoprop was less than that resulting from any treatments that included both PPI and LBI applications. 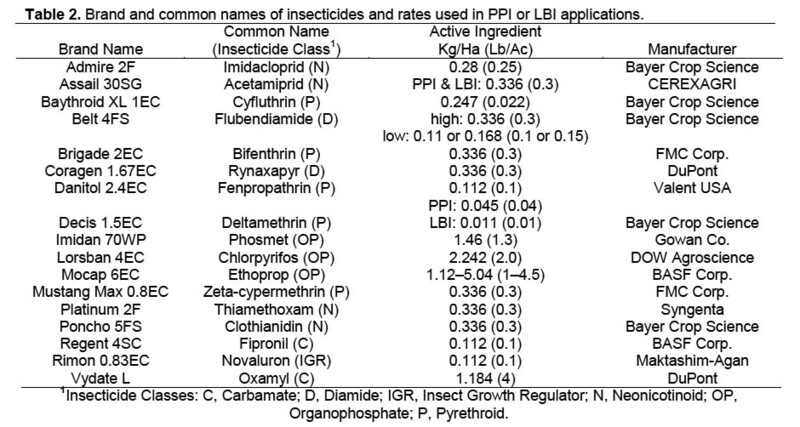 Results of other compounds used as PPI insecticides that were evaluated more than once are compared with the PPI treatments of the standard chlorpyrifos and bifenthrin in Table 5. Because of the variation within treatments as evidenced by large standard error values, only those means on the extremes differed significantly from each other based on ANOVA. Deltamethrin, imidacloprid, and flubendiamide resulted in negative percent control, indicating that more damage occurred in those treatments on average than in the water-treated check. Only rynaxapyr, fipronil, and thiamethoxam showed promise as PPI insecticides. Results varied greatly within treatments, possibly associated with uncontrolled factors such as moisture conditions that varied from drought to wet conditions from year to year or among trial locations within a single season, date of application, temperature at time of application, insect species present, or other factors. These data exemplify the fact that numerous trials over several years are required to establish confidence in the effectiveness of individual PPI insecticides. Figure 2. 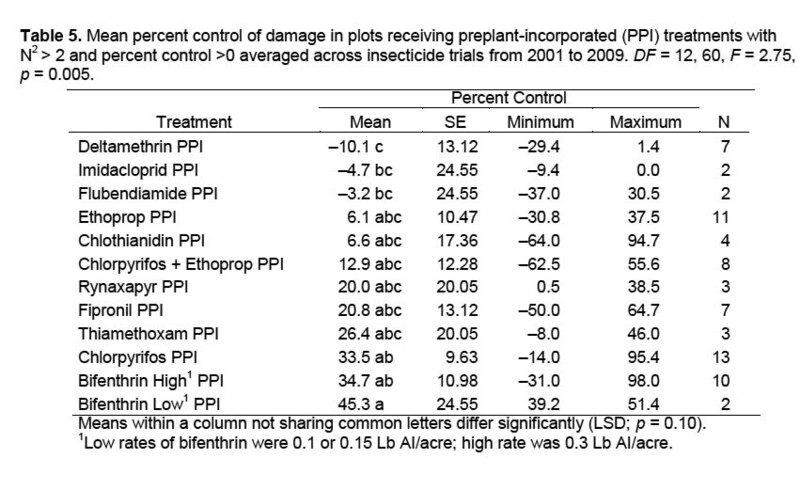 Mean percent control of damage averaged across preplant-incorporated (PPI), layby-incorporated (LBI), or PPI plus LBI insecticide trials from 2001 to 2009. 1N = number of times treatment was evaluated. Low rates of bifenthrin were 0.1 or 0.15 Lb AI/acre; high rate was 0.3 Lb AI/acre. Seventeen compounds or combinations of compounds were evaluated for use as soil-incorporated insecticide applications for the protection of sweetpotato plants from soil-inhabiting, root-feeding insects. Based on percent control values, bifenthrin, chlorpyrifos, thiamethoxam, fipronil, and rynaxapyr demonstrated 20% to 45% reduction of damage to sweetpotatoes at harvest when used as a preplant-incorporated application applied within one week prior to planting date. The use of bifenthrin for both PPI and LBI applications resulted in an average of nearly 80% reduction in damage compared to the water-treated check, and chlorpyrifos PPI followed by bifenthrin LBI application averaged about 50% reduction in damage regardless of the bifenthrin application rate. Results indicate that there is a trend for increased percent control obtained by following PPI applications an LBI application of bifenthrin, however treatments with the bifenthrin LBI application did not significantly differ in any case from that of the PPI applications alone. Percent control varied greatly among and within treatments when averaged across trials. Factors such as drought, high temperatures, incorporation depth, and other factors probably affect efficacy of soil-incorporated insecticides. Since some compounds used in these analyses were limited to 2 or 3 trials, additional trials under a range of conditions are needed to establish their efficacy and potential value in sweetpotato insect management. We acknowledge the efforts of Norman Clark, Andy Clark, Evans Shaw, Jamie Earp, Keith Pettit, and Steven Bailey, sweetpotato producers who dedicated land, time and assistance in completing many of the trials summarized in this article. Approved for publication as Journal Article No. J-11807 of the Mississippi Agricultural and Forestry Experiment Station, Mississippi State University. Chalfant, R. B., and D. R. Seal. 1991. Biology and management of wireworms on sweet potato, pp. 303-326. In R. K. Jansson and K. V. Raman [eds. ], Sweet Potato Pest Management: A Global Perspective. Westview Press, Boulder, CO.
Chalfant, R. B., S. A. Harmon, and L. Stacey. 1979. Chemical control of the sweet potato flea beetle and southern potato wireworm on sweet potatoes in Georgia. Journal of Georgia Entomological Society 14: 354-358. Cuthbert, F. P. Jr. 1967. Insects affecting sweetpotatoes. Agricultural Handbook No. 329. Agricultural Research Service, United States Department of Agriculture. 28 pgs. Cuthbert, F. P. Jr., and W. J. J. Reid. 1965. Four little-known pests of sweetpotato roots. Journal of Economic Entomology 58: 581-583. Fleming, D. E. 2009. The spotted cucumber beetle (Diabrotica undecimpunctata howardi): Interactions with cucurbits and its status as a sweetpotato pest in Mississippi. [master’s thesis]. [Mississippi State (MS)]: Mississippi State University; 2009. 118 pgs. Fronk, W. D., and L. E. Peterson. 1956. Wireworm control in Iowa sweet potato fields. Journal of Economic Entomology 49:479-481. Griffin, J. A., and W. G. Eden. 1953. Control of the gulf wireworm in sweetpotatoes in Alabama. Journal of Economic Entomology 46:948-951. Kantack, E. J., and E. H. Floyd. 1956. Control of some insects which damage roots of sweet potatoes in the field. Journal of Economic Entomology 49:766-768. Reed, J. T., M. W. Shankle, M. R. Williams, W. B. Burdine, and D. E. Fleming. 2010. Results of southern sweetpotato IPM project in Mississippi. Mississippi Agricultural and Forestry Experiment Station Research Bulletin 1181. 14 pgs. Reed, J. T., D. E. Fleming, T. L. Schiefer, D. Bao, and C. S. Jackson. 2009. Insects associated with sweetpotato, Ipomoea batatas (L.), in Mississippi. Midsouth Entomologist 2:10-16. Schalk, J. M., A. Jones, P. D. Dukes, and J. K. Peterson. 1991. Approaches to the control of multiple insect problems in sweet potato in the southern United States, pp. 283-301. In R. K. Jansson and K. V. Raman [eds. ], Sweet potato pest management: A Global Perspective. Westview Press, Boulder, CO.
Seal, D. R. 1990. The biology of wireworms affecting sweet potatoes in Georgia [dissertation]. [Athens (GA)]: University of Georgia; 1990. 180 pgs. Thomas, W. A. 1927. Injury to sweet potato by Systena taeniata var. blanda larva. Journal of Economic Entomology 20: 236-237. Zehnder, G. 1997. Population dynamics of whitefringed beetle (Coleoptera: Curculionidae) on sweet potato in Alabama. Environmental Entomology 26: 727-735. For information about this page, contact Joe MacGown. This page was last updated on 16 April 2015.